See how 3D is making a difference in K-12 education. Learn how it can fit into everyday curriculum during Richmond County Schools' 3D Open House, on Sept 28, 2013. You can join in too: Educators in STEM and state school officials are invited to attend the 3D G.R.E.A.T Open house at Richmond County School district on September 28, 2013. Experiment with 3D software and 3D printing. Share students' 3D scanning and 3D printing projects, video game designs and 3D designs. 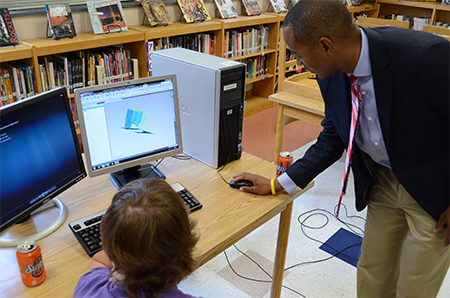 Meet 2013 White House award winner Jeffries Epps as he discusses his work bringing 3D to elementary, middle and high school students. Join in hands-on sessions about 3D technology along with discussion on how to get kids involved with 3D technology, how to inspire girls to pursue STEM careers, and how 3D technology is quickly becoming a requirement for jobs of all kinds. 12.00pm - 2.00 pm - observe. Hear opening remarks from Jeff Epps and 3D Systems Geomagic. Take a conducted tour of 3 classrooms where you will see students developing 3D games, creating designs, and scanning objects into 3D. See 3D printers creating those designs in physical form. Groups will be rotated. Refreshments will be served throughout. 12:30 pm Richmond Early College student Ben Dibble and Brooke Massa, a Biologist with the N.C. Wildlife Resources Commission, will demonstrate and discuss the "Green Growth Toolbox" a collaborative project that utilizes 3D simulation to aid in preserving natural habitats. 1.00 pm. Presentation of Cube 3D printers to Jeffries Epps by 3D Systems in recognition of his efforts in implementing 3D in schools and his recent White House award. 2.00 pm - presentation and Q&A. Exposure, not teaching. Exposing students to 3D is not teaching! Mr. Epps and Chad Osborne bring their experience to bear in how students are attracted to 3D and how teachers can learn as much as the students through trial, error, trying again, bringing problem-solving skills into the equation and allowing students the freedom to explore what interests them. How to attract girls to the program and applications that can make that easier. You get to ask the questions. There will also be a "call to action " to urge and invite local and regional business to partner with RCS and provide real world challenges for our students. 3.00pm - 5.00pm - hands on. Students teach the teachers. Allow the students to show you how to scan, create 3D and print 3D. Spend time with volunteers from 3D Systems learning about 3D printing.